David Ogilby brought the curtain down on his Coleraine career on Friday night. After eight years and 233 appearances for The Showgrounds club ‘OG’ took to the pitch for the final time to play a friendly against his home town team, Lisahally, who he will rejoin next season. The support here at Coleraine is second to none. They have taken me to their hearts since the first day I came through the gates, I can’t thank them enough. 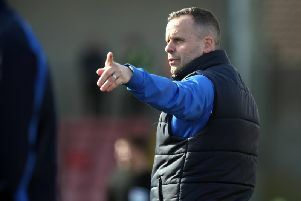 “It was an emotional evening, obviously I knew it was going to be my last game, but it couldn’t dreamt of a better ending, winning the Irish Cup, going to my home town team and playing against them here tonight,” said Ogilby. The fans came out in their thousands again to welcome the Irish Cup winners back to the town before the game. “We couldn’t believe the crowds of people who turned out to welcome us, it’s a credit to the people of Coelraine,” said Ogilby. “It’s probably a bit of a sign that they’ve been starved of a bit of success because it hasn’t happened in 15 years. “I’m certain they won’t be waiting another 15 years for the next trophy. “I just said to the players there in the changing room after they made a presentation to me, now the ice is broke and the cup is sitting in there, the sky is the limit. “We were under pressure to get that first trophy, but we have that now, the belief is there now, we will be expecting to play in cup finals and league deciders. Ogilby has experienced a wide range of emotions during his spell on the Ballycastle Road, but he said signing off with an Irish Cup win is even sweeter after coming through some tough times. “There was some hard times during my eight years here,” he said. “We lost nine on the trot at one stage, it was mentally tough coming out on to the pitch during that run. “People weren’t happy and rightly so. “But you learn from that and it makes Saturday even sweeter. “Myself and Oran are the only two left from that time, we’ve went through the mill to get here, but it’s very sweet now. “There’s such a buzz about the players since the final. “I’ve been waking up every morning and I have to remember I’ve an Irish Cup winners medal. Ogilby signed off with the final goal in the 7-0 win over Lisahally from the penalty spot, and said he’s going to miss match days at The Showgrounds. “I’m going to miss everyone in the changing room, it’s a special bunch of players,” he said. “I’ve saw lots of players come and go, but there’s a special buzz about this group. “Obviously I’ll miss lining out in the tunnel before the games, small things like that which make a difference, and clapping the fans after you get a win. “I’ve hit a few plenalties here in my time, one was in the cup quarter final replay against Glentoran, but that one tonight wa spressure against my home town team.